I’ve opened this pinot to match to three slices of fillet steak with three different one-side glazes. One is smeared with pomegranate molasses (from Lebanon), one with Kalamata Orange and Lemon Balsamic Cream and one with Kalamata Strawberry Balsamic Cream (the latter two both from Greece). I pan fry the steaks to medium rare. While they are cooking I taste the wine. The bouquet is sensually smoky and savoury with bright touches of Morello cherry and fruit of the forest connotations and, after smelling the pomegranate molasses, I reckon that hard-to-put-the-finger-on scent is pomegranate most definitely. The wine is silky in its flow across the palate with just a teasing sense of tannin and the taste is foremost savoury with a subtle oak frame around cherry and cranberry-like fruit flavours and a juicy succulence to the after taste. All of the steaks were melt in the mouth tasty with the strawberry balsamic cream glaze just nudging into first place for me. The wine is made from pinot noir grapes grown in Central Otago vineyards in Parkburn (10 ks north of Cromwell) and the Gibbston Valley Back Road, it states 14% alcohol by column on the back label. Price is around NZ$43 from Rockburn – worth visiting their cellar door in Cromwel btw – possibly cheaper elsewhere, however quite likely more expensive at other places. Anyway, if you are looking for upper echelon priced pinot from CO, this I definitely recommended. I loved it as a food match with the steaks. For everything you want to know about this consistently reliable pinot noir producer, hightail it off to their website: rockburn.co.nz. 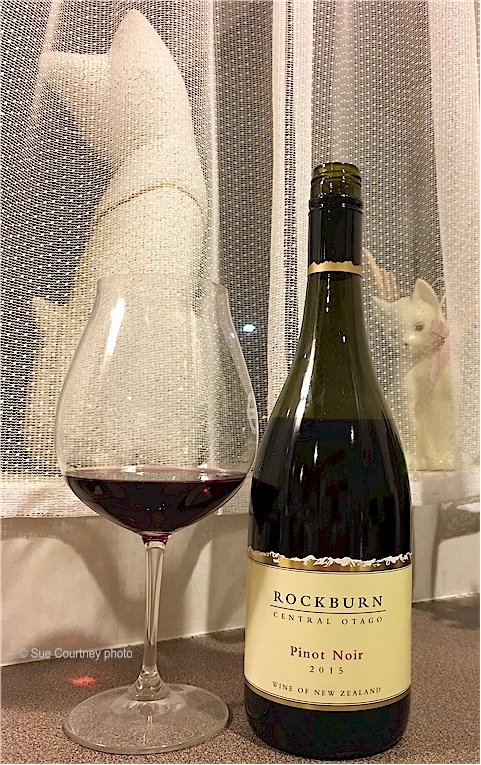 This entry was posted in #nzwine, central otago, pinot noir and tagged 2015, Rockburn by Sue Courtney. Bookmark the permalink.